"Enter a world filled with labyrinths, magic, and monsters! You can take the role of a cleric, dwarf, elf, fighter, halfling, magic-user, or thief on your quest for glory, treasure, and adventure! This is a complete role playing game. All you need are a few sheets of paper and some dice. Welcome back to a simpler old-school gaming experience. The Labyrinth Lord awaits your arrival. 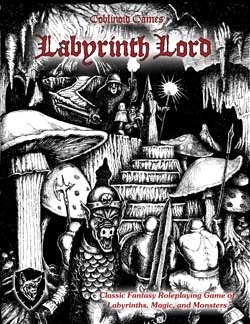 Can you survive the dangers of the labyrinth?" This is the complimentary free no-art version of the game. This title was added to our catalog on September 07, 2009.